Design ideas for a garden wedding cake make a spring or summer reception come alive. 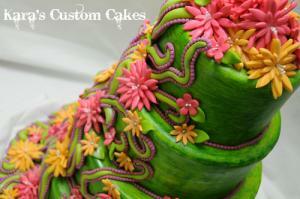 Incorporate lush garden colors and textures in your wedding cake decorations for a truly spectacular showpiece. Although it may not seem appealing to memorialize worms, dirt, and the more unsavory aspects of gardening in cake form, focusing on the bright and beautiful is a great way to get a breathtaking dessert. Buttercream flowers are the most affordable and look the least realistic. They don't take much time for a decorator to create, and you'll have your pick of colors, since it's simple to tint buttercream with any shade. The frosting is tasty, with a rich flavor and soft texture, and it looks best with roses, sweet peas, and flowers that are somewhat voluptuous. If you've having your wedding outside and you expect the weather to be hot, keep in mind that buttercream flowers and other decorations do run the risk of melting. 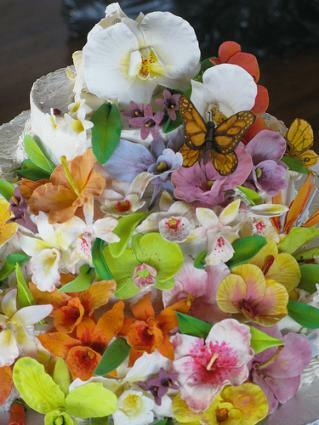 Fondant flowers are made from a sugar paste that has a very sweet taste and somewhat chalky texture. Many people prefer the look of fondant over buttercream but don't enjoy the taste. If you want your flowers to look somewhat realistic but don't care if they're quite to the level of photorealism, fondant may be a good frosting choice for you. A cake with fondant flowers is likely to cost more than the same cake with buttercream blossoms, but many brides and grooms feel that it looks more professional. Gum paste flowers are the most expensive and take the longest to create. In the hands of a capable decorator, they'll turn out looking incredibly realistic and, in some cases, even indistinguishable from actual flowers. Gum paste is a sugar frosting that dries hard and looks better than it tastes, but if you want extreme detail and very ornate work, it's the frosting for you. It's not a problem if you're not a flower person. If you still want a garden theme for your wedding cake, you can express it in a less-floral way by featuring plants instead. Herbs, leaves, tendrils of grass, beautiful vines and shrubbery are all options that can look fantastic after a talented decorator is through with them. It's true that a green cake is an unconventional choice, but the verdant hue of your dessert is likely to draw plenty of admiration from guests and will look amazing in pictures. If you're going to show off a garden with your wedding dessert, why not make it a vegetable garden? Guests will enjoy the juxtaposition between the savory, sugar-paste vegetable models and the sweet cake, and you can even go all out with rich, devil's-food "dirt" layers if you want. To do a vegetable garden cake, you'll need to find a decorator who can handle fondant well and has a good eye for color as well as texture. Before you talk designs, check out a cake gallery or do a web search so you can see what's been done before. One of the best things about a garden cake is that no matter how wacky or colorful you want the outside to be, you can still preserve whatever flavors you like on the inside. It's fine to go with the traditional vanilla/vanilla cake and frosting pairing, or you can choose chocolate, a fruit flavor, something exotic, or even cheesecake. One unique flavor idea that reflects the garden theme is to incorporate vegetables, such as with a zucchini cake or carrot cake. 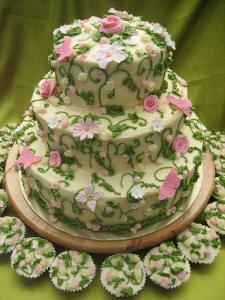 Enjoy the creativity that a garden cake offers. Whether you're having it in the spring or not, use it to showcase your true love for outdoor beauty.